Stop wasting your time with ineffective ways of studying and get the inside scoop on how to get high grades, by using less effort and time consuming ways of studying! A lot of frequently used study strategies aren’t so effective, indeed, some even are counterproductive. Some small changes might dramatically improve your test results… Yes, even for statistics! Sleep is for the smart! Sleeping less and studying more, often seems like the right solution when the clock is ticking. However, neuroscientists confirm the importance of sleep in learning and memory consolidation. Less sleeping time can, even on the short term, result in lower levels of concentration and impair memory and reasoning. PS: it’s also bad for your skin (let’s not forget about brains ánd beauty)! Food for thought: stop skipping breakfast! Research confirms the relation between skipping breakfast and poor cognitive performance. Results also indicate that breakfast is positively related to being able to study, listen and concentrate better. Breakfast also seems to be negatively related to school absence and tardiness. Give yourself a break! Taking breaks on a regular basis during a day of studying results in better recall of information according to scientific evidence. So now you have a scientific excuse to crash on the couch! Newsflash! Multitasking doesn’t work! It may seem like you’re saving time by doing a lot of tasks at the same time, however, this doesn’t pay off. Studies show that multitasking is often incredibly distracting, and does not increase performance. Mark my words! Highlighting is not that effective as you may think. Studies on highlighting texts, haven’t been very positive. Based on research, marking texts doesn’t seem that beneficial in addition to just reading your books and articles. It can even hinder performance in a sense that it’s harder to differentiate between what’s important and what is not. In addition, it can also put the focus too much on details, whilst making it more difficult to see the bigger picture. So the highlight of the story, stop highlighting! Set Goals! To study efficiently, it’s very important to set goals. Not just vague goals or ones that are way too high to achieve, but clear and realistic goals. Also, be honest with yourself, if you spend half of your time on Facebook and Instagram, it might be time to take some action and blacklist those evil distractors! Drink, drink, drink! No not alcohol, water! A few extra glasses of water can already make a difference, when you’re not drinking enough. Being hydrated is very closely linked to physical and mental functioning. There is plenty scientific evidence underscoring the importance of hydration on health. Dehydration can impair short and long-term memory, lead to fatigue and decrease cognitive performance. It can also lead to less calorie consumption. So cheers to a high grade and a healthy body! Test yourself! 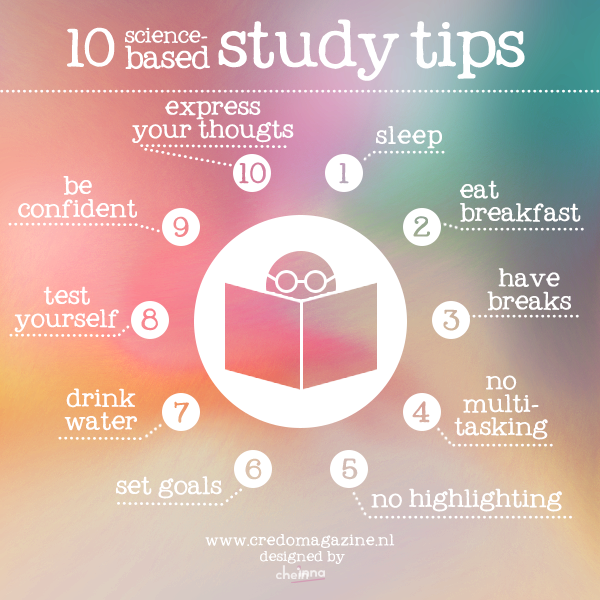 Psychological studies have shown that it can be very useful to test yourself every now and then on the subjects that you have been studying. By actively retrieving the information, it is better stored into long-term memory. However, for this method to work, the information needs to be retrieved successfully more often than not, and the test trials shouldn’t be extremely easy or difficult. Believe in yourself! Self-efficacy is the belief in your own capacity to perform a task successfully. Research indicates that high self-efficacy is related to higher performance. High levels of self-efficacy can result in a positive feedback loop. Because you believe in yourself and your own capability, you will set higher goals, and by achieving these goals, your self-efficacy will further increase. So stop doubting yourself and start to believe! Express yourself! Writing about fears can help students to increase their performance. This has to do with a concept called ‘choking under pressure’. Some students perform less well than they are really able to, because they’re afraid of failure. This fear, or anxiety can be the result of a very important test or because there’s a lot to win when passing, among other reasons. It comes down to too much pressure. An efficient way to relieve yourself from that pressure is through expressive writing. Take a moment for yourself, just before the exam, and start writing down everything that’s on your mind and related to ruminations about the exam. According to scientists, this procedure can make students, who would perform lower under pressure, perform on their actual level, because the expressive writing gives them more room to think. By writing down your worries, you free your working memory and prevent distractions during the test, so give it a try and wave those bad grades goodbye!